^ a b c Darville, Jordan (August 4, 2016). 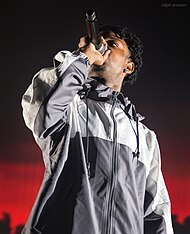 "21 Savage Talks Being An 'A' Student, Losing His Best Friends On The Breakfast Club". The Fader. Retrieved July 10, 2018. ^ "21 Savage – The Slaughter Tape". LiveMixtapes. Retrieved April 27, 2016. ^ "21 Savage – Free Guwop EP". LiveMixtapes. Retrieved April 27, 2016. ^ "Top 200 Albums | Billboard 200 Chart – The Week of July 29, 2017". Billboard. Retrieved January 2, 2019. ^ "Top 100 Songs | Billboard Hot 100 Chart – The Week of August 26, 2017". Billboard. Retrieved January 2, 2019. ^ Haffenden, Dayna. 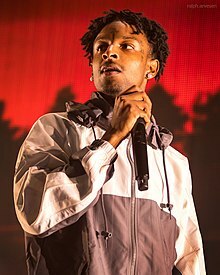 "21 Savage Unveils Title and Cover Art for New Album". XXL Magazine. Retrieved December 31, 2018.